This article will introduce partition software to extend C drive when Diskpart failed to extend it on Windows Server 2003 2008 2012 in VMware. Download IM-Magic Partition Resizer Server to extend C drive on Windows Server VMware when it cannot be extended by Diskpart command. When you want to extend C drive with help of Windows build-in Diskpart command, you may receive message that the selected drive cannot be extended. If so, you can rely on third-party partition software to resize the hard disk so as to increase the size of C drive. IM-Magic Partition Resizer Server has the function of extending and shrinking partition without repartitioning the hard disk. By relying on this partition software, you can safely resize hard disk on all Windows Servers in VMware when Diskpart cannot extend the drive. Download, install and run IM-Magic Partition Resizer Server on your PC. Right click a partition that has lots of free space and choose "Resize/Move". Move the unallocated space close to C drive. Then, right click C drive and choose "Resize/Move". Extend C drive and click "Apply" button. "I need to expand C drive in Windows Server 2003 VMware. Diskpart command said that the selected drive cannot be extended. My brother told me that I can only extend NTFS data volume with Diskpart. I cannot extend C drive by using Diskpart because operating system is installed on this partition and it is FAT32 file system. However, how can I increase the size of C drive in Windows Server 2003 VMware when Diskpart failed?" "My PC is running ESX 3.5 with Windows Server 2008 64bit OS. 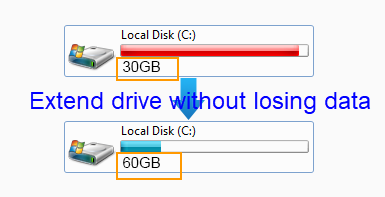 Recently, the C drive in VMware is running out of disk space, so I want to extend the C drive space. But Diskpart command is unable to extend a system partition and Disk Management extend volume is grayed out when I want to extend C drive. Is there any other solution for C drive extending in Windows Server 2008 VMware?" First of all, Diskpart command cannot extend system partition; instead, it can only extend data volume. As you know, operating system is usually installed on C drive. Therefore, you may fail to extend C drive by relying on Diskpart command. In addition, Diskpart can only support NTFS partition. Even if it is data partition, Diskpart cannot extend it if its file system is FAT32. Finally, Diskpart cannot move partition. If there is no unallocated space behind the partition you want to extend, you still cannot extend the selected partition. If you run into any of limitation mentioned above, you cannot extend a partition by using Diskpart command. When Diskpart cannot extend C drive, you can use IM-Magic Partition Resizer Server. This partition software enables you to extend C drive no matter it is NTFS or FAT32 file system. The partition software allows you to extend C drive Windows 2003 with diskpart in VMware, 2008, 2012, Windows SBS and Windows Server R2 operating system. With this software, you can easily increase the size of C drive without reinstalling system or reformatting hard disk, so it is safe to perform hard disk resizing with this partition software. 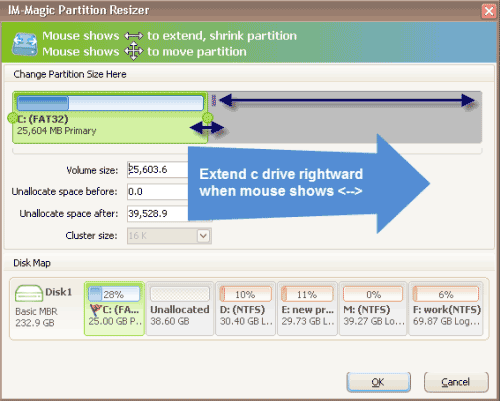 As professional partition software, IM-Magic Partition Resizer also supports to extend RAID 5 partition. If C drive is running out of disk space on Windows Server RAID 5 in VMware, you can move free space from other partition on the RAID 5 to extend C drive space by using the software. Besides, you can also add new disk if there is no other partition on RAID 5. By using this partition software, you can resize C drive on RAID 5 VMware without rebuilding the array or reinstalling system. So it is time-saving and efficient. If you want to extend RAID 5 C drive, you should not break the RAID array before partition resizing. Besides, when you want to add a new disk, you should make sure if the new added disk can be compatible with the array.